we approach the Region One Budget vote on May 2, here are a few thoughts that came to us come from some students, teachers and parents, not only about the schedule, but the overall future of Region One. The identities of those who were willing to come forward will not be released. To The Region One Report this is scary stuff. What do you think? Now on to a related topic. It is very apparent that here is a huge lack of communication within Region One between the Region One Board, The All Board Chairmen, and the administration. Here are just a couple of examples from the last two board meetings. Example 1:At the budget meeting when the BOE was surprised at the new items being added to budget, and clearly unhappy..what happened? More miscommunication and more misunderstandings with Chair Andrea Downs saying that the BOE “thought” those items were included under professional development.It is hard to understand why didn’t they ask that at the meeting as it is clear those were new items. Example 2: At the next meeting the $46,000 to pay for the NEASC training is out of the budget and will be paid for by grants. After inquires about the grant money taxpayers were told exact numbers were not known and taxpayers should email inquiries. Taxpayers also asked who the leadership team is.. and once gain are told that they do not have that information and email that request and they will be glad to provide. And yet the information requested was not provided. And after asking about the grants, the questions still not answered. This is real..just watch the Region One BOE meetings on video. Why are parents and staff on these schedule committees not allowed to communicate with one another during this process? Could it be they are being kept separate so the administration can tell each group what the administration wants them to hear? This administration has now created an even greater divide among faculty, students, parents, the BOE, and the administration itself. The Region One administration itself continually posts updates on the meetings.. but then, in reality, tells the people attending the meetings to not discuss what is being reviewed. The only views that are exchanged between the groups and the public are the administrations views of those meetings. The parent group and the leadership team are being kept separate, and the parent group and the leadership team, and the public are spoon fed information from an administration intent on total control. There are now many more questions for the public to ask other than just the schedule. But with the budget vote Tuesday, May 2, it is our opinion that the budget be should be voted down for initially until the administration give a direct commitment to keep the same schedule in place, while transparently working with teachers, parents, students and the leadership team. 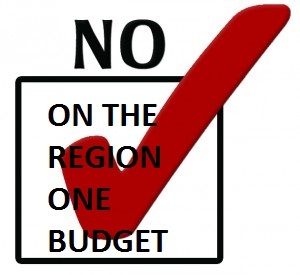 On Tuesday, May 2nd vote NO on the Region One budget, this is your only chance to pressure the administration and board into action on the many concerns the public has. Please share with as many taxpayers as possible, lets use social media to turn out the NO vote on Tuesday, May 2.